SEGA has announced a 'Digital Bonus Edition' of Sonic Forces; like the retail Bonus Edition it'll include some free DLC outfits, but sadly pre-ordering the download for the bonus is only confirmed so far for Xbox One and PS4. On the plus side, Switch is included in the bigger announcement - that Shadow will be playable in the game. That's part of the free 'Episode Shadow Add-on' DLC that will arrive on launch day. It'll have three new levels, and you can see some footage and story below. 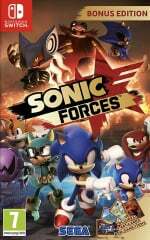 A prequel to the main storyline of Sonic Forces, this add-on content explores Shadow's allegiance, the fate of Team Dark, and the origin of the mysterious villain, Infinite. You'll also be able to play through ten Modern Sonic levels as Shadow, too. Are you pleased with this free addition to Sonic Forces? Sounds cool. I mean, who can be upset about free dlc anyway? @Yasaal That's assuming the game is so bad that it needs him. Let's wait a bit before dissing the game. You can't complain at free content. Anyway, free DLC are good, but what is the use of free day one DLC? Might as well be included directly in the game. Alright, own up. Who asked for this. @pandarino Is there something I should know about? Oh man, I'm so excited for this! Shadow the Hedgehog is my favorite character, AND my favorite game in the series! This is shaping up to be my favorite modern Sonic game, and I haven't even played it yet! XD Nobody could kill my hype! Come on November 7th! I got my bonus edition pre-ordered and couldn't be more excited to play it, this just makes it even better. My only gripe is that it's coming out too soon after Odyssey, so it's possible it may go unplayed for a while. I wish it was out now instead. The more I see of this game, the more skeptical I become. Stages look so generic. Pretty cool element, but I think the level design continues to be pretty bland compared to Generations. @mikegamer reddit does not deserve to be mentioned alongside 4chan. IMO reddit right now is the only place online where you can actually have meaningful interaction with people who share a common interest.The upvote system really helps bury most of the toxicity so present in every single other website, including NL. @pandarino Those guys are dumb then. Remember Mario Kart 8's free Mercedes DLC? Yeah, no. People will still complain regardless if it's free. @nab1 you clearly have not been to the more political reddit areas. @Kalmaro Well, to be fair, any political discussion turns any site into a mess mate, even this one. @Kalmaro Well, yeah, good point, I forgot to mention, it can depend on which subreddits one subscribes too. @nab1 Generally though, you're right, I turn to reddit often when looking for like minded individuals. Here's hoping the game isn't the typical 3D Sonic kind of terrible. Mania was phenomenal, but I feel like Forces could shatter the bit of confidence in the future of Sonic that Mania gave me. Here's hoping I'm entirely wrong. It's wonderful that it's free, but the only way I can see this making sense, is if the idea for it, came after the game has already begin printing. Otherwise, it should have just been included on-disc. I understand that including it might have seemed disconnected from the main story. To me, it almost seems like co.s purposely do this, to get us in a mental state of considering dlc a "norm"; especially day-1 dlc. Still, I reiterate, it's wonderful that it is free. I have a friend who is a huge Sonic, & shadow fan; he'll def(definitely) enjoy this. Finally, In under 2 months I will have a modern Mario and Sonic in the same console... Amazing. Next few months not filled up with overpriced ports or indie nonsense... Time to Log some miles on the switch again. I didn't much like Shadow's game. Didn't hate it, it was ok, pretty average... completed it once, never felt the urge to play it again. But my son LOVED it. He still talks very fondly about watching me play it when he was a kid. So yeah, thanks Shadow for giving us a happy family memory! @Damo Your avatar pic and your reply made me laugh. I can see them asking that question. Lol! @Yasaal You never know, sonic colors wasn't all that horrible and generations was refreshing, for the most part. @8-Bit_Zorldo Let's hope. It stands to benefit Sega, too, since I'm sure Mania was far cheaper to develop than Forces. Really strikes fear into the core of your being, doesn't it? So if Shadow is going to be a bad guy in the game, why is he killing the bad guys? The fate of team dark? Like team dark from sonic heroes? Also this game still looks pants. It's about time. I've been waiting over a decade to play as him in a platformer again. PLOT TWIST, Maria was a robot all this time. Ugh, that level just looks so empty and bland. I still need to play Mania, but the only thing keeping me from buying that game is that I don't like the 2D Sonic games a lot. But this.. I don't know how I feel about this. Shadow being playable is a good thing though. @samuelvictor haha, yeah - I think just having the 2 icons on the switch home window will be amazing. I didn't get Sonic Mania. Not really in the "retro" thing... Why so glad there is both a modern Mario and Sonic for me this time around. But cool you enjoyed it, why choices always good! This could mean, Tails and Knuckles will be playable at some point with DLC? Awesome!! I love Shadow; he's one of my favorite game characters. Can't wait until Nov. 7th! Exactly what I was thinking - this sets a good precedent for future content updates or the possibility of more playable characters/play-styles within the game. I'm also hoping that these would come with a greater challenge to them, as the Shadow gameplay above seems to have the red stuff as part of his stage mechanics which could result in some trickier actual platforming. @BensonUii Because initially Nintendo made it seem like it was going to be forced product placement through an update, rather than something you could choose to download off the Eshop. There's a big difference. @AgramonteThanks. I actually enjoy a lot of the 3D Sonic games. Obviously Generations and Colors, but I also liked Lost World, Heroes, Adventure... even the ones I don't like as much still get bought and played through at least once as I just like Sonic and the characters and world and music etc anyway. I think Forces looks decent at the very least, and am looking forward to it. But I'd been waiting for a new "proper" home console 2D Sonic game since 1994... I bought a 32x, and it never came. I bought a Saturn, but it never came. Sonic 4 came out... and it really wasn't what I'd hoped for. Mania was clearly made by people who had the same experience, it's totally what a 32bit 2D Sonic could have been. Despite enjoying many of the 3d games, I'm still not sure any 3d Sonic has managed to be the "perfect" 3d evolution of 2d Sonic, or at least how I imagined it should be as a child/teen. Strange, as Mario 64 pretty much nailed 3d Mario first time, imo. The first action stage in Sonic Adventure 1 came close to what I imagined 3d Sonic would be like, but it was annoyingly glitchy, and didn't have the level of exploration available in the 2d games. @Mopati In traditional 2D Sonic games (like Mania), yes the slopes are hugely important to the overal feel and flow of each level, as you actually have to use physics and get momentum up to get round the loops etc. If you learn the level layouts properly you can go through and work out the best way to complete them in the fastest, smoothest way possible - eventually homing it down to an experience somewhat like speedrunning. Its very satisfying when you get it right and truly master a level. Its frustrating when you get a badly designed level that doesn't allow for this (Mania has no such levels, they are all really nicely designed). 3D Sonic games brought in a mechanic whereby Sonic can "lock on" to the enemies, basically you press the jump button twice and he will automatically reposition and hit the nearest enemy or object (whereas in the old 2d games it takes skill to accurately jump on enemies). This type of semi automatic gameplay soon evolved into what people describe as the "Boost" style of play where you are constantly auto-targeting springs and devices to move forward really fast without worrying too much about accuracy. Some people love this style of gameplay, and find the old style frustrating and hard. Others like the old style gameplay and feel the "boost" style is shallow and too "on rails". Basically that is the reason there is a big divide between "Classic Sonic" and "Modern Sonic" style play, and why with Generations, they literally split the game into two types of gameplay, with two "parallel dimension" or "time travelling" (can't remember which) versions of Sonic working side by side, to cater for fans of both styles in one game. It worked pretty well, and both Modern and Classic Sonic are in Forces, and its developed by the same team, so many people hope this game will be like a sequel to Generations. @Damo I did. Seriously, it's a continuation of the Sonic Generations concept, so why not include Shadow? Like him or not, he was a big part of the series for a while, and Sonic Forces is celebrating a lot of Sonic's history. This game just doesn't look great to me. I will probably pass. What could be better than a new game? A new game with free dlc available at launch! There's some serious range on that homing attack. I'm happy Shadow's back as a playable, but I have no idea what this game is doing with him. I'm ready to give it a whirl. Here's hoping. About time, is the only thing that comes to mind. Sonic fans love the characters and not -just- Sonic. Last time Shadow was playable in a main game was 11 years ago. Wow... the levels looks so boring and uninspired... based on what I saw there isn't much of gameplay... it seems like an on rails timing fest. Pass for sure! @Tendogamerxxx "on rails timing fest" lol I got that feeling too. Sonic Adventure 2 is amazing. Sonic generations was really fun. Whats really missing is the CHAO GARDEN!!! It brought so much replay value. Day one DLC should not be considered anything "extra" people. Its definitely content they couldn't finish before the game went gold. Great that its included (big shadow fan) but its just part of the game not a special bonus. Like.. I dunno why can't they just refine hire someone with imagination. Its sad that a bunch of fans can design better 2D levels than Sonic Team. Shadow is probably my favorite Sonic character (him or Espio), but im still not sure if I want this game. Oh look, a '3D' Sonic game that spends 85% of its time in 2D. We have Sonic Mania for 2D, why can't we get a fully 3D game as well? If its free day one dlc, they could have just included it on the card! Playable Shadow? Given the Switch's portability, this will mark Shadow's debut in a handheld Sonic platformer. Well, a normal handheld Sonic platformer (the Rivals duology doesn't count). @Kingrat This is basically O6 done right, remember that dlc that allow you play as the other characters?